As parents, we’re all fully aware of the struggles that come with attempting to navigate the minefield that is your child’s bedroom or nursery. There are teddies, unicorn toys, cars, Lego, dolls and that’s only the toys you can see. Who knows what lies beneath the surface after your children come to the end of a full-on 4-hour play session. As tempting as it is, you can’t simply chuck all the toys into one big box and say it’s tidy. Fate has a cruel way of making your children want the toy that’s at the bottom. Let’s cut to the chase and get things tidy. To get you started, here are some of my favorite toy boxes and chests, designed to clear up the clutter and to help you enjoy a little more calm in your life. Why Do I Need a Storage Box/Chest? What Are the Benefits of A Toy Chest/Box? Just wow. I couldn’t have asked for anything more than the Step2 Roll Toy Box. This awesome box has over 3 cubic feet of space that helps to create a wondrous chest of goodies that your child will love. Thanks to this large amount of space, your child can easily fit in all of their books, toys, games, clothes, and whatever else they want. Easily the best thing about this chest is just how portable it is. At the front, you’ll find two built-in handles that are perfectly sized and shaped for your child’s hands. At the back, you’ll find two durable poly-plastic wheels that are designed to care for your home’s floors, so the chest doesn’t scratch them. 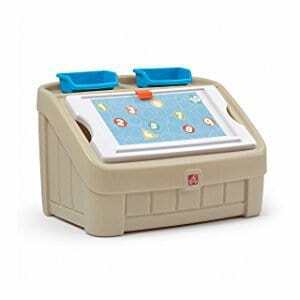 Once your child has finished moving the box to where they want to play, they can simply pop it down onto the two front legs that will fully support the weight of the box without marking your floor. What's Great About It: Since your children can move this box around with them to any room in the house, the chances are that they’ll leave it there. Thankfully, the neutral color scheme is designed to suit any room of the house while still looking fantastic. The name, the design, the graphics; everything about this chest is simply adorable. This fabric chest is made from 100% durable polyester materials with cardboard inserts to maintain the rigid shape. 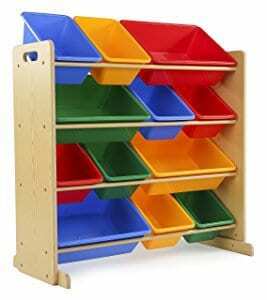 This design makes the chest incredibly lightweight to carry and move around, making it easy to keep a well-organized playroom or nursery. There’s a soft fabric lid to help keep everything out of sight while not in use, letting you breathe a breath of fresh air, especially when you can be sure that you’re not going to stand on any toys as you make your way across the room. This chest is incredibly easy to use, and my children love it. It is a great way of teaching them about staying neat and tidy in a fun and organized way. What's Great About It: I just love how personal these chests can be. 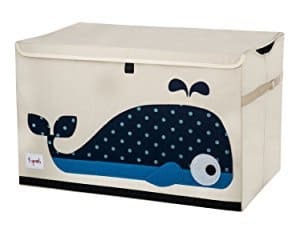 With the 3 Sprouts chest, there are ten designs and color schemes to choose from, including a whale, elephant, and crocodile, meaning you can choose your child’s favorite. If you’re looking for a larger, more permanent toy chest, then this super cool chest from the Step2 is ideal. This chest gives you an incredible 4.5 cubic feet of space that is perfect for nestling into the corner of your playroom, nursery or bedroom. That’s a ton of internal space for your child to fill up with all of their toys, games, clothes, puzzles and whatever else you need to get off your floor. However, what really got my children excited about this chest was just how many other features it has. On the main lid of this chest, you’ll find a creative art space, complete with a clip, giving your children a stable surface for their drawings and artistic masterpieces. We even used it for putting puzzles together. What's Great About It: On top of all these amazing features, there’s more. With you in mind, there’s minimal assembly required to set up and position this toy box, and it’s easy to maintain. This is thanks to the lightweight plastic materials that you can simply wipe clean. If your children have a lot of large toys and you’re looking to maximize space, this awesome, highly spacious toy chest is perfect. When tidying up and using a traditional storage box, I found that large toys, such as big fluffy toys and toy car sets simply used up far too much space and I couldn’t get everything in. That’s when I tried this chest, and with over 6 cubic feet of internal space, it was everything that I could have needed. This toy chest is lightweight and easy to set up in any room in the house where you need it. The lid of this bin is also detachable for safety reasons, giving your children unrestricted access during playtime. There are also two removable bins underneath for even more storage. There's so much space that your children won’t even know what to do with themselves. What's Great About It: I love the neutral colors that this toy chest set has. The vibrant red and blue scheme makes it easy for your children to identify the box as well as remaining gender neutral and perfectly suitable for every kind of room. Sometimes, it’s easier just to spread everything out, give it a dedicated storage space and keep it within easy reach. This is exactly what the Tot Tutors Organizer does. As you can see, the organizer is designed to look like shelves, but instead has a variety of uniquely colored bins. 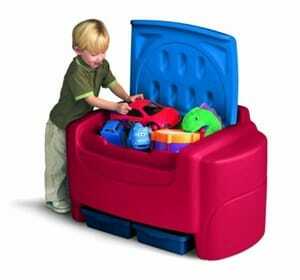 This gives you a huge amount of storage where every toy can have its own dedicated place. This makes sure that your children know exactly where every toy goes so it’s always ready to play with next time. This is a great trait to teach your kids from a young age as it will stay with them for life. This set comes with 12 bins in total, 8 smaller trays, and 4 large compartments, but there are more readily available if you need them. The shelves themselves are made from solid wood, giving you a sturdy finish that is built to last for many years to come. There are multiple color scheme options available, making it easy for you to choose a set that looks great in any room in your house. What's Great About It: I love that the trays in this shelf are easily removable. For example, you could keep all your children’s art supplies in one drawer. Then, when you want to do some art, simply remove just that tray, and everything you need will be available. This is also massively helpful when tidying up. The idea of a toy chest or a storage box may seem like a foreign idea, and as you can see from my list, there’s a lot to take in. This makes choosing the perfect one for you a little more difficult. However, read on to learn everything there is to know about these storage products, helping you to make the right decision. Nowadays, children have access to an absolute ton of play things, especially if they have very generous grandparents. 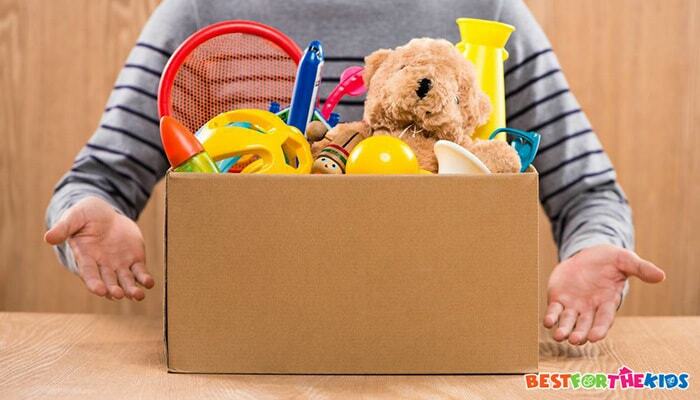 Typically, you won’t be able to simply chuck all their toys into one tiny box. This is because everything will become so disorganized and messy. 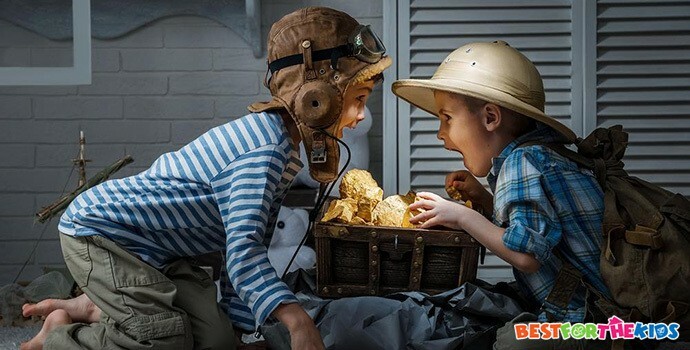 What’s more, we all know what it’s like when our little ones can’t find their favorite toy. By buying a storage solution, like the ones above, you can organize everything, so it’s easily accessible at all times. There are a ton of benefits that you can enjoy by getting the right toy box/chest. As you can see, many of the toy boxes, especially the ones with shelves and multiple boxes, all come with different colors and styles. This means that when it does finally come to tidy up time, you can teach your child about the values of being organized and classifying toys by where they need to go. You can teach them that this will help the toys be readily available next time they want to play with them, rather than them going missing. This is a benefit that will stay with them for the rest of their lives. When it comes to toys, buying the right toy box means your children can really feel like they have their own treasure chest of goodies. Not only will this fill your children with delight, but it also helps you to keep your house tidy and feeling like a proper home.